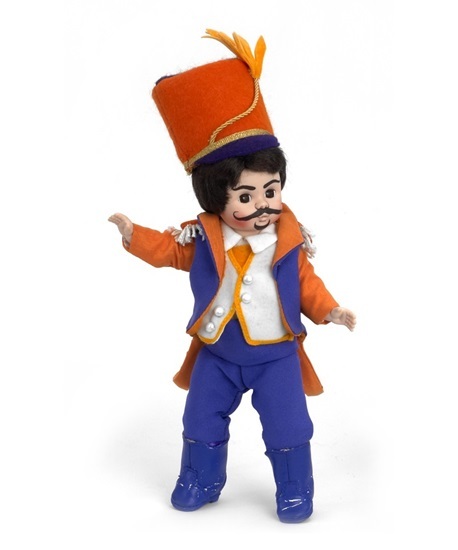 The Munchkin General Doll is from Madame Alexander's Wizard of Oz Collection. He is an 8” fully-articulated doll with brown eyes, short brown hair, and an astonishing moustache and goatee. He’s dressed smartly too, in a uniform that includes a purple jacket with orange collar, sleeves, and back. The purple pants, white shirt and white flock vest, worn with the jacket, are all attached. Orange braided trim and white pearl buttons accent the vest and a purple belt is worn over the jacket. White socks, purple boots, and a magnificent orange flock hat with a purple top and brim, as well as gold trim and a gold feather, complete the very smart look for the Munchkin General who was introduced in 2012.